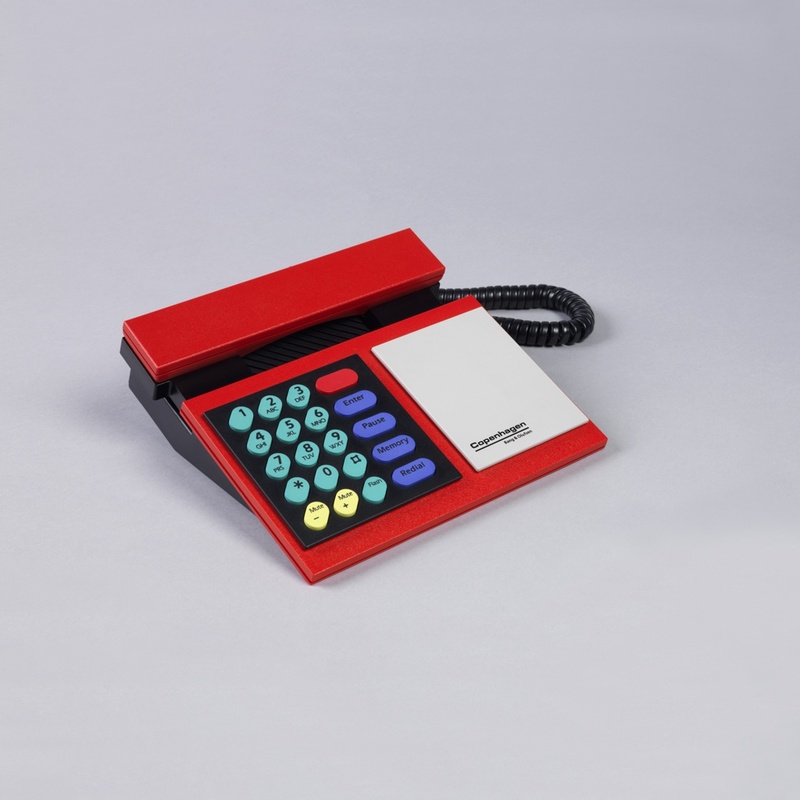 Throughout the late 1980s and early 1990s, the design team and one-time couple Gideon Löwy and Lone Lindinger-Löwy created a series of telephones called BeoCom, made for the Danish consumer electronics manufacturer Bang & Olufsen. The prefix “beo” is standard for all of Bang & Olufsen’s major products and the ending references the device’s purpose: communication. The company created devices that exhibit not only the highest technical standards but that were also visually compelling. For this reason, they hired designers such as Löwy and Lindinger-Löwy to bring a fresh visual approach to electronic products such as the desk telephone. Describing the couple’s design aesthetic, Gideon Löwy noted that, “whatever we do, we like to throw in some humor somewhere…in some little corner we like to do something that could draw a smile and get beyond the feeling that this is just serious design.” The use of bold and varied colors as well as the phone’s compactness create a sense of playfulness that stands in stark contrast to the austere and bland designs of many other telephones at the time. But this use of color serves more than an aesthetic purpose; there is also a utilitarian purpose. The keys are grouped according to their function: green keys indicate numbers and symbols, yellow keys control volume, and blue keys denote commands such as redial. According to a press release from around the time of this phone’s production, the company aimed to create products that were characterized by simplicity and predicated on the user-experience, saying, “technology exists to serve mankind, not vice versa.” Using color to signify function fulfills this aim. The BeoCom line of telephones came in a variety of color combinations and ranged in their technical specifications, but they all took on the same grid-like form. The two designers even patented the design, citing the novelty of the phone receiver’s cradled positon as well as its unadorned design. This object’s modern yet joyful sensibility makes this phone about more than just communicating. It is about communicating in style. This objects is currently on view in Saturated: The Allure and Science of Color. Ben Green is a graduate student in the History of Design and Curatorial Studies program offered jointly by the Parsons School of Design and the Cooper Hewitt, Smithsonian Design Museum. He is a Fellow in the museum’s Product Design and Decorative Arts Department. Robert Cross, “Harmonious design: A Danish team strives for speakers that make a balanced statement,” Chicago Tribune, October 22, 1989. Bang & Olufsen, “Bang & Olufsen: A 64-Year Tradition of Technical Superiority and Design Excellence,” 1988. Lone Lindinger-Löwy and Gideon Lindinger-Löwy, Telephone Set, US Patent D300927, filed December 8, 1987 and issued May 2, 1989.